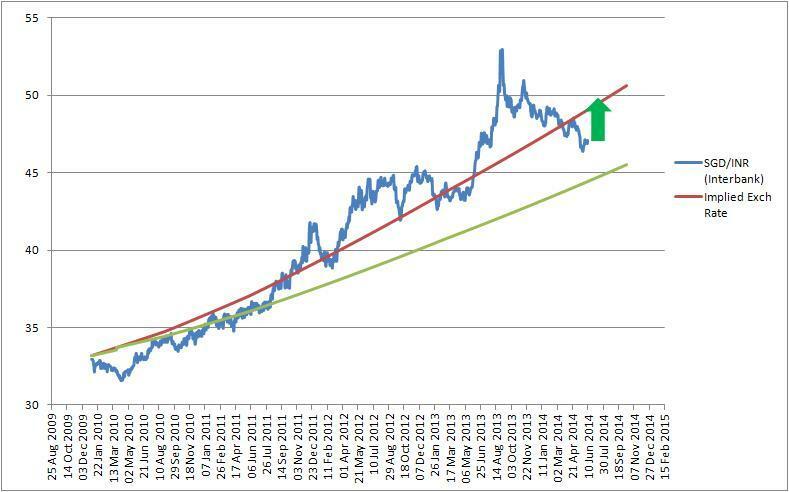 Finally the SGD INR RATE crossed 50, it’s taken 3 years for the pair to return back to this level and there is more appreciation to come. In Aug of 2013 the Rupee was battered to all time lows and the RBI had a new Governor in Raghuram Rajan in September. The fiscal situation looked bad then with oil at all time highs and political uncertainty in India. With some bold policy moves (NRE FD’s and FCNR scheme) and good luck (falling oil prices) the RBI was able to reign in the fall and stabilize the foreign reserves situation. But with global uncertainty in form of referendum on Britain’s exit from EU, the trajectory of Fed fund rate increases and increasing oil prices exit of RBI governor could not have come at a worse time. The FCNR deposits of 3 years back are due for redemption between Aug and Nov of this year which would be a 20 billion USD outflow of reserves. Gold and Oil prices have bounced back from all time lows which will add to India’s woes. If Britain decides to exit the EU then the global uncertainty will increase and any foreign firm will reevaluate their overseas investment plans which will include India. What is most surprising is that a RBI governor who has been dead correct in warning the other federal reserves that cheap money policy is not a cure to global financial woes and has been instrumental in stabilizing the Rupee and control inflation is being let go due to political reasons – just because he decided to disagree with the government and force them to make the right policy changes he is being penalized. Anyway the damage has been done and I would not be surprised if Rupee hits the 75 mark against the USD by November this year and if that happens SGD INR will be at 55. However in the short term a range of 49 to 52 would be seen. For today I expect intraday volatility where after the initial fall RBI will try to stabilize the Rupee though a gradual fall in coming weeks should be expected as the international event unfold. ….. And remember 52 is not far away. Indian Rupee is Overvalued and Chief Economic advisor agrees!! Rupee is Overvalued and should depreciate – something I have been saying for 3-4 months now but for lack of time had not been able to do some research and share with everyone my thoughts behind the my assertion. The rupee has been stable against the dollar but has appreciated against a basket of currencies, severely effecting the exports competitiveness. India’s exports declined for third month running in February. Rupee has appreciated 22.4% against the euro in the current financial year. On a trade-weighted basis, and after adjusting for inflation, in February rupee was the rupee was over 24% overvalued against a basket of currencies of India’s six largest trade partners. Now lets look at the competition – Countries that export goods and services to the nations above – big ones being Indonesia, Malaysia, Brazil, Russia, South Africa and the currency of all these countries have depreciated against Indian Rupee giving an advantage to competition. I think it’s a perfect time for India to weaken the Rupee while Oil remains low to boost competitiveness of exports and fill up our foreign exchange reserves. At the same time build oil reserves so that even when oil prices move up we don’t have to strengthen the currency in tandem to prevent the outflow of petro dollars. 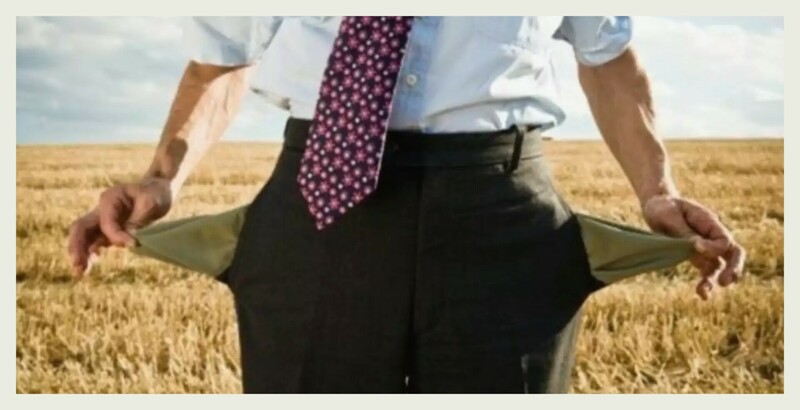 SGD INR: 50 with SG@50? Ever since the Prime Minister Modi came to power the feel good factor about Indian economy and India has increased dramatically. All Indians, including me, are rooting for improved Indian economy – infrastructure reforms, streamlining of tax code, improved law and order and not to forget getting back the black money stashed in overseas accounts. The expectation also is for the Rupee to strengthen as reforms kick in and help kick-start the much-anticipated economic growth. The past few months have seen the pair oscillating between the 46-49 range and the volatility in the forex markets has been nothing short of a roller coaster ride. The pair dropped all the way to 46.5 after the elections and bumped back up towards 49 only to test 46.5 again as the oil prices slid in the international markets (I was expecting a 45 floor as mentioned in replies to questions in the previous post). INR has weakened against the USD to 63 as I had written earlier in (SGD INR: Post Election Euphoria) but interestingly SGD has also weakened in tandem. At one point in time the fall in SGD was greater as compared to INR and caused SGD INR to test 46.5. Time flies and it’s already June – I can’t believe that the last I wrote about INR was in February and whole world was speculating on the outcome of the Indian elections. I did not expect the BJP to win with a full majority given the polarisation of votes, combined with regional politics and was expecting a hung parliament. Based on that I had predicted that the Rupee would fall back to the 63 mark against the USD and 50 against the SGD (SGD INR: A storm in making). However, to my delight, the BJP did get a full majority. This meant that the uncertainty of a hung parliament and issues cropping up from coalition government were instantly non issues. The markets reacted favorably to a government formed by progressive and reform oriented leaders and pushed the Indian Sensex to all time highs of over 25,000 and Rupee appreciated quite quickly to the Rs.58 mark against the USD. With many a Indians residing in foreign countries who remit money to India the obvious question was – Is the rupee headed to 55 against USD and should I transfer money to India now? and the calculation suggests that the SGD INR would move back towards the upward trending implied exchange rate line as the RBI is going to hold the interest rates steady – the inflation is still alarmingly high. As I write the Indian rupee has already crossed the 60 mark against the USD and 48 against the SGD and I maintain that the INR would move towards the 63 and 50 mark against the USD and SGD in coming months. One would have expected things to remain calm for a few more weeks in 2014 before the Indian Budget and upcoming elections in March and May respectively but the global markets had something else in mind. The Federal Reserve started the much-anticipated tapering of Quantitative Easing (QE) in December, with reducing the Bond purchases by 10 Billion USD a month to 75 Billion and followed it by a reduction of another 10 Billion in January 2014 which spooked the emerging markets. Turkish Lira and Hungarian Forint were aggressively sold off and the Argentinian Peso is unofficially devalued. The data from China is not exactly exciting and Indonesian Rupiah and Thai Baht have their own set of problems to deal with. At the same time the RBI came out and surprisingly increased the benchmark rates in January announcements which I thing was more of a pre-emptive move to shore up defences against any potential sell off in the Rupee. 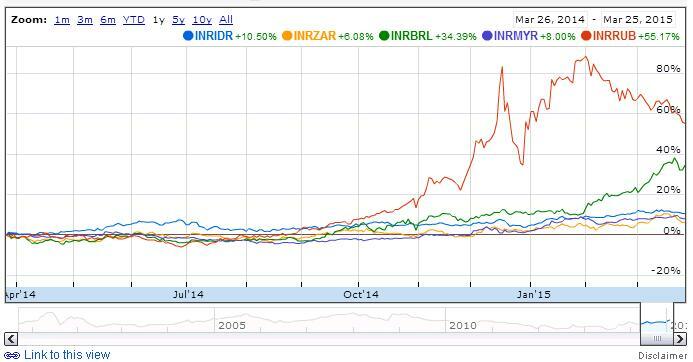 With such weakness in the other Emerging market currencies the Indian Rupee, I must say, held ground very well. But this is just the start of the year and there are quite a few events lined up in the coming months that would determine which way the Rupee moves. On the global macro side the course of Global Financial Markets a.k.a. the pace of QE would drive the general sentiments towards emerging markets. On the domestic front The Indian Budget announcements and the general elections would be the key determinants. Looking at the global front I do not expect the federal reserve to stop tapering and ultimately end the QE program unless there is definitive bad news on the US unemployment and inflation. This reduction in QE would be Rupee negative and as in May – Aug 2013 time frame has the potential to push the Rupee down. On the domestic front anything short of a stable government with full majority would be a negative for the markets. I think that this stage there is no one clear party that I could say would achieve the majority. So in the short-medium term of next 3-4 months the chips are stacked against the rupee and I do expect it to touch trade towards the 65-67 mark. What that does to SGD INR? Well the SGD has slightly weakened against the USD and has been trading at 1.27-1.28 area. Deteriorating global fundamentals tend to result in strengthening SGD as a safe haven currency. So with the expected weakness in the Rupee and potential appreciation of the SGD, SGD INR could march back to the 53 mark in the coming months. The US debt and budget talks finally reached a resolution yesterday, the congress passed the bill and the much feared US default was averted and the financial markets breathed a sigh of relief. Interestingly the Indian Rupee has been pretty flat both pre and post the US saga. The drop to 69 against the USD on 28 August was the low point for the Rupee and it steadily regained lost ground in September (Rupee Doing a Bungee Jump – Time to bounce back?) and hovers around 61 as I write. I often ask myself what has really changed in the past month but can’t find a fundamental reason for the pull back. My take is that it was a technical pull back with Rupee being oversold. Yes one could say that RBI got a new Governor in Raghuram Rajan and that helped Rupees cause, but if changing governors could help the Rupee strengthen by 15% then maybe RBI should abandon monetary policies and use governors to set the direction of the currency :). Looking at the fundamentals nothing really has changed in the past 2 months – RBI did come up with a FCNR scheme, increase the duty on import of Gold and television sets and a benchmark rate increase. The FCNR scheme is reported to attract 10 billion USD in deposits which would add no more than 3% to the foreign currency reserves. The increase in duty on gold has got the premium over spot soaring in indian markets and made gold smuggling attractive and the increase in duty on television sets has made travel to Thailand and Singapore less attractive – believe it or not bringing in television sets from overseas trips was a great way of subsidizing foreign travel. On the policy front nothing really has changed in India and no progress is expected until after the next elections in 2014. On the global front there is still a lot of uncertainty and the fear of Quantitative Easing (QE) taper is still there. The general consensus is for no taper before late march 2014 but its an event that will happen sooner or later. With all the uncertainty and political wrangling I expect the Rupee to remain directionless to the year-end. 63 should act as the pivot against the USD with a variation of 5% either side – a range of 60-65 would be the order. However against the SGD things should be slightly different with 50 acting as a strong magnet. Its hard to believe that we are already in February of 2013 and that calls for me to keep up on my promise and share with you my thoughts on SGD INR movements in the near term. The trend so far has been inline with what I had expected in Dec 2012 – The pair has maintained the range of 42-46 with a downward bias (Read more: SGD-INR: How does 2013 look like?) and trades at 42.99 as I write. SGD INR made multiple attempts to breach the 45 mark but have been unsuccessful. In the meantime a few interesting developments have happened on the fundamental front. RBI came out and cut the rates by 25 basis points to stroke growth and the financial markets have taken a more “risk on” approach. The former would result in NRE deposit rates being lowered in the long term and the latter would attract FII in to the Indian Markets chasing growth. At the same time the Indian Finance minister has promised financial reforms and started with reducing the fuel subsidies which helps reduce the Indian Budget deficit. This is also positive for the Rupee. On the SGD front the currency has lost 2% against the USD and now trades at 1.24 as compared to 1.22 late last year. These factors combined have seen SGD INR soften below 43 mark. The question which people ask often is that how low will the pair fall and will SGD INR reach 45 again? My view is that in the short term the pair would increase and move to cross the Rs.44 mark – The US debt ceiling discussions are due soon and so is Indian budget for 2013. The uncertainty on the policy front would result in INR weakening against the USD which would mean a weaker INR against the SGD. The recent spike in Crude Oil prices would add to woes for Indian Rupee. So in-case the recent drop of SGD/INR has left you scrambling like Oct 2012 then don’t panic – next few weeks should give you an opportunity to see the pair touching 44 again. 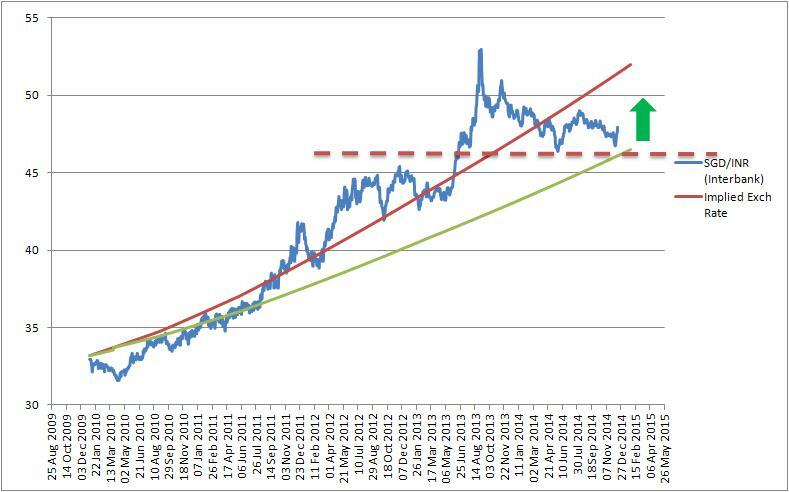 SGD INR: How does 2013 look like? 4 more days for 2012 to end and its a perfect time to analyse what would 2013 be like for the currency pair. 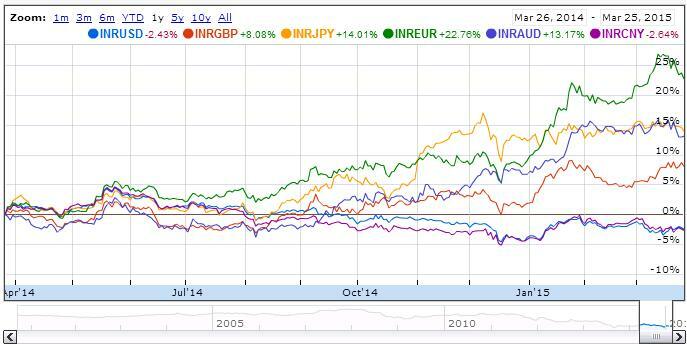 SGD-INR started the year 2012 at 41.28 and trades at 44.80 at the time of writing, a gain of 8.5%. The pair touched a low of 38.88 and highs of 45.11 during the year a volatility of appx 12%. Let me take stock of how the past analysis has fared before delving into how the pair could move in 2013.